It didn't take but a day or so before I started getting emails asking if one of the new Swift Fly Fishing Epic 7'9" ten weight Bandit fly rods would be offered as part of the T.F.M. Fly Rod Demo Program. I forwarded a couple of the emails to Carl McNeil of Swift Fly Fishing and he graciously offered up a blank if I could line up a builder. No problem. I have admired the work of Robert Spalliero of Custom Fly Rod Crafters and luckily he agreed to complete this build for the program. Robert received the blank some time back and is just now getting everything in place to complete the build. I am really liking the direction of things so far. Robert wrote... "Here is a photo of components that I'll go with on the Bandit build and I will be gluing up some rings tonight for a 7" full wells. The main thread is out of the vintage box, it's Gudebrod champion light green, it will turn translucent. With the color of the blank (gold sparkles), I didn't want to break the color up. Tipping in a sulky metallic. I don't usually go with sulky, but this blank is perfect for it. This sulky color is a dark green with shades of gold. Alps .620 lite Ti aluminum seat. Lite Ti stripping guides, snake brand snakes, and large loop Ti tip top. Wrapping will commence as soon as you sign off." Yes, yes, and YES. This is going to be a sharp build and I can't wait to see what this blank is capable of. I'm thinking this might be the short big fly rocket that many have been needing for musky flies and offshore. 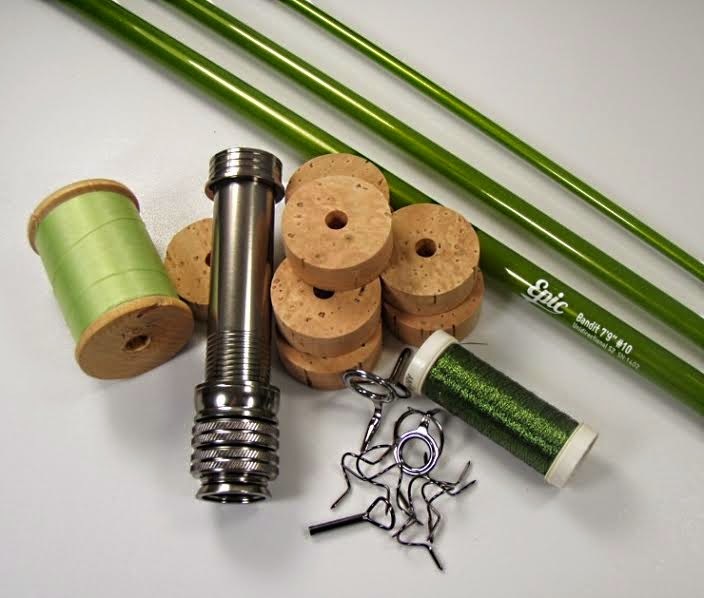 Check out Custom Fly Rod Crafters for Epic blanks and all your rod building needs and look for updates on this build as it comes together. That's gonna be a hot rod. The blank reminds me of the muscle car era "lime gold poly" color code from the 60's Ford Mustangs. TML...it's a cool color of green. Mick...this one is going to be a bomber for sure.